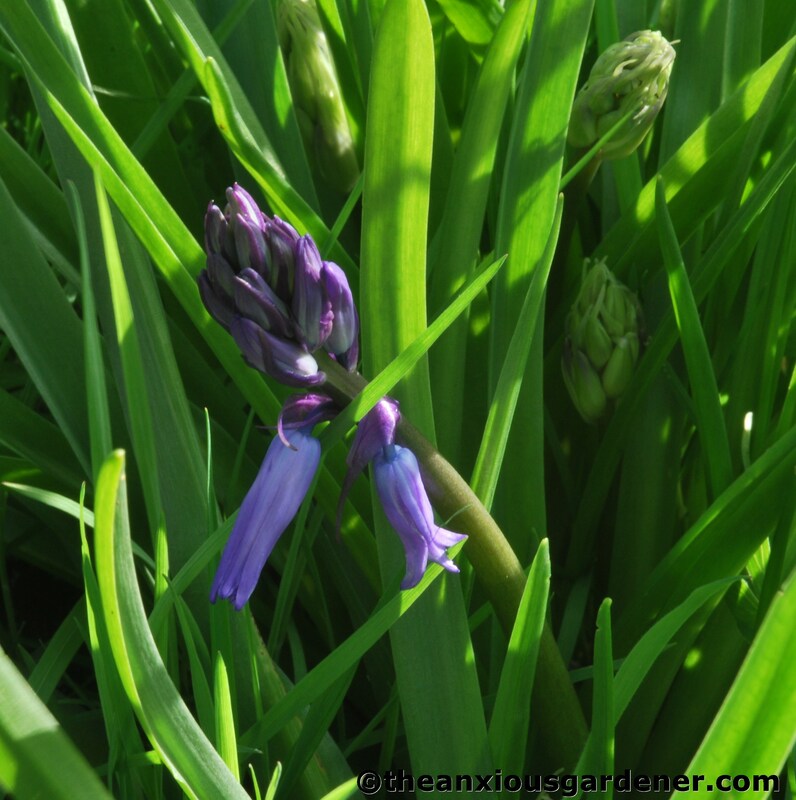 April is a busy month for gardeners and the sheer amount of flower can be a little distracting. Plants are elbowing through to the fore, hurling themselves into flower and screeching, “Me, me, me. Look at me!” And very pretty it all is too but I do wish (a little) that they would just calm down a bit. I find myself whispering, “Very nice, but just take it easy, OK. Slow down pal, slow down; there’s plenty of time.” As distracting as it is, I want the show to run and run. Forsythia in bloom. A neighbour's cottage at The Old Forge. 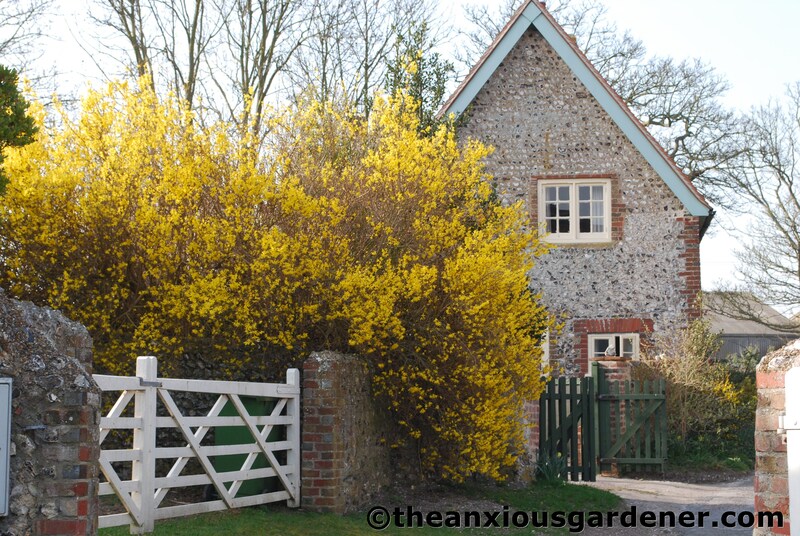 … forsythia, are looking mighty fine in this, their lime-light moment. There is a forsythia up against the house and under a window at the Priory. Seems an odd place to plant one as, once the main event is over, it is a dull shrub. But, with an underplanting of forget-me-nots, I have no plans to remove it. Yet. 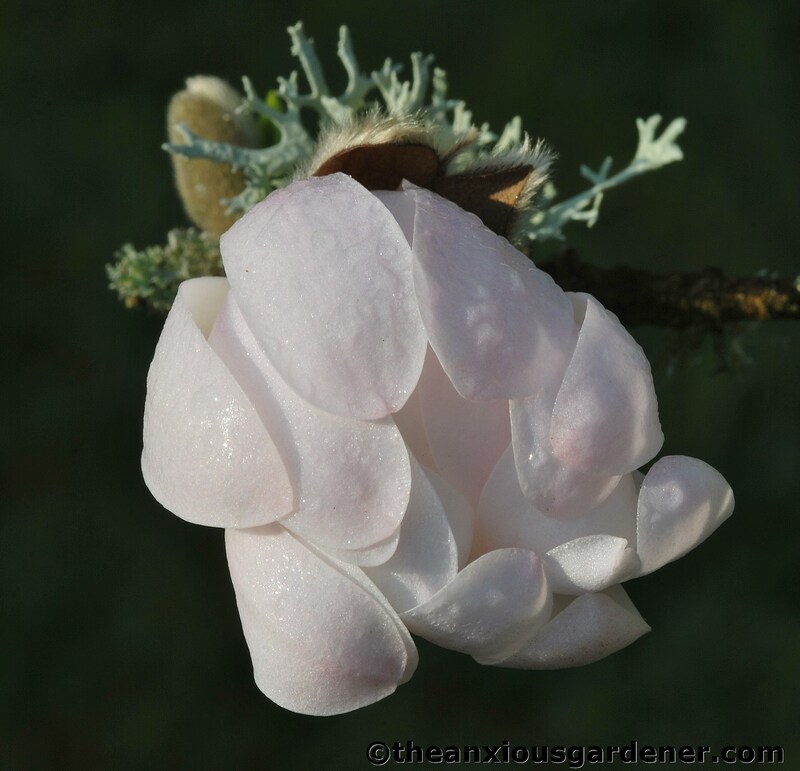 Something I would have planted (had there not already been one) is Magnolia stellata. Such perfection is rare on this particular little tree but the absence of late, hard frosts this year has left the delicate blooms unblemished. I must stress that, actually, I have planted some stuff myself (this is important; it’s my job). 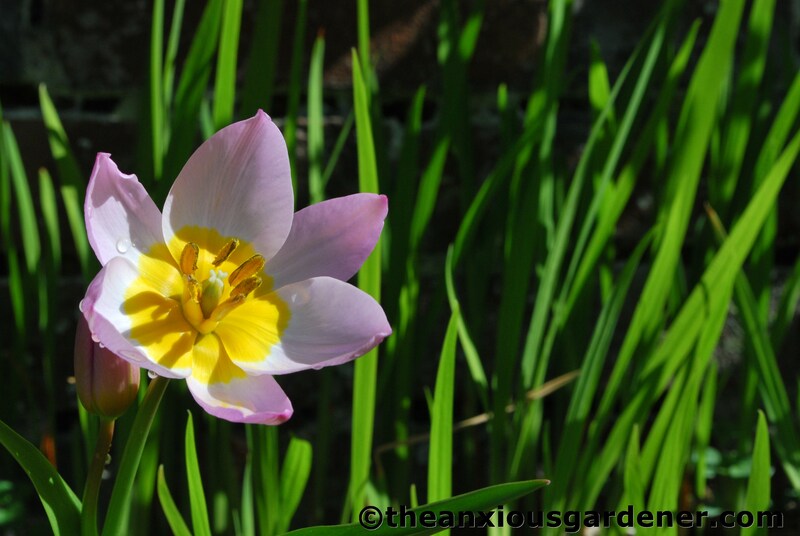 Here Tulipa bakeri ‘Lilac Wonder’ flowers against a backdrop of fresh crocosmia leaves. 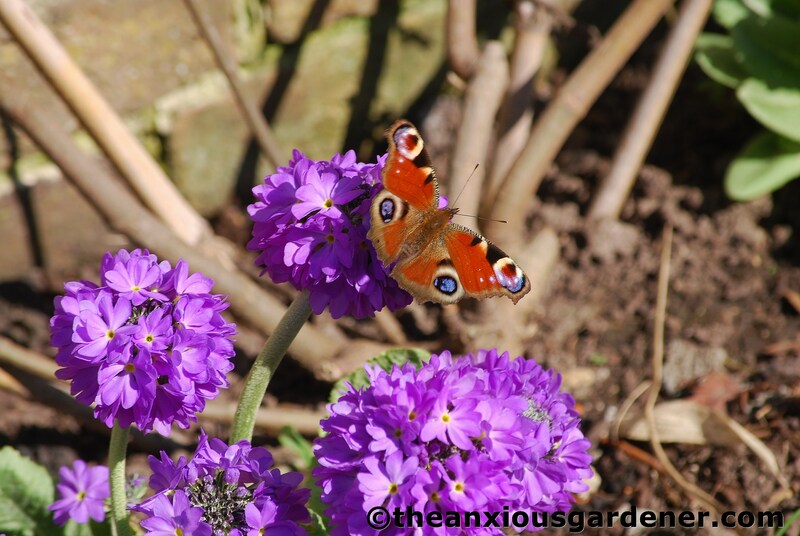 Primula denticulata with the first Peacock butterfly of the year - 28 March. And beneath a young fig tree, a clutch of primulas attract an early visitor; always gratifying that I have helped to attract wildlife. But as much as I would like to claim credit for all the beauty in the gardens, sadly, I can’t. One of my favourite areas of the Priory is a bank, running down from the greenhouse to a drainage ditch. 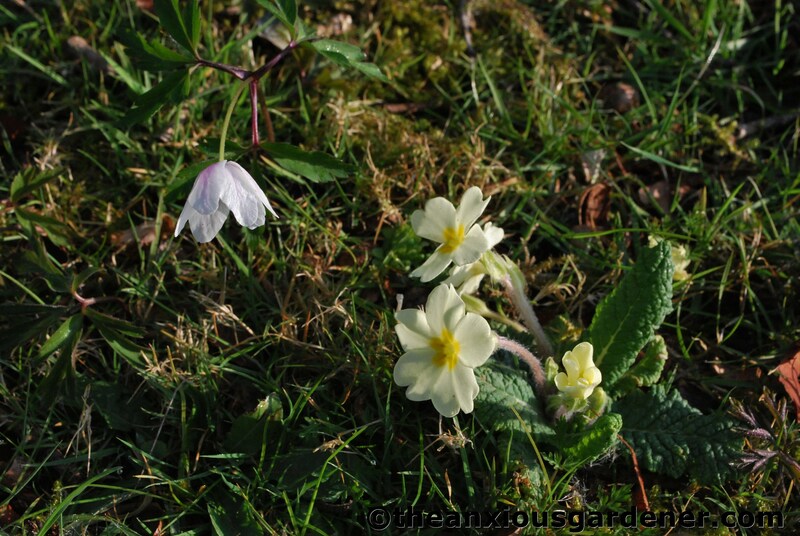 I strim it once or twice a year but certainly not in Spring when, after the crocuses are over, it is speckled with primroses, the odd daffodil, wood anemones and cuckoo flowers. 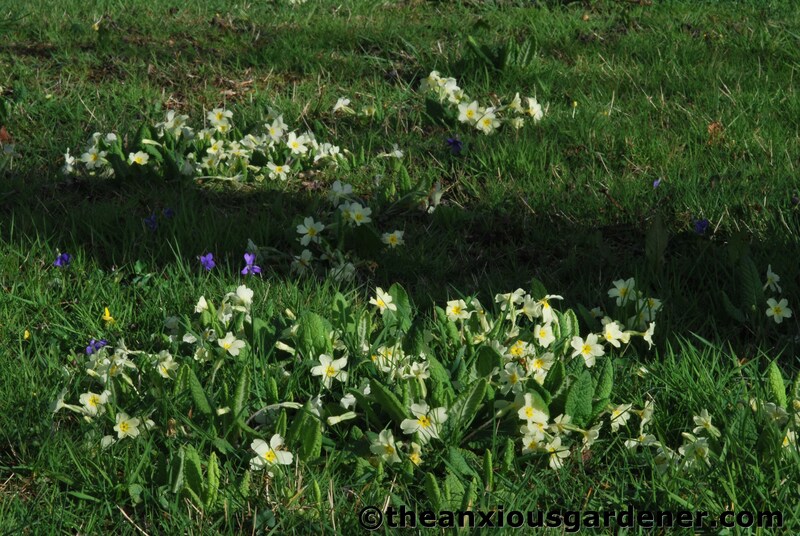 Primroses (Primula vulgaris) grow throughout the estate. … here self-seeding themselves into places they really shouldn’t. But, bad as such behaviour is, I can’t always bring myself to root them out. 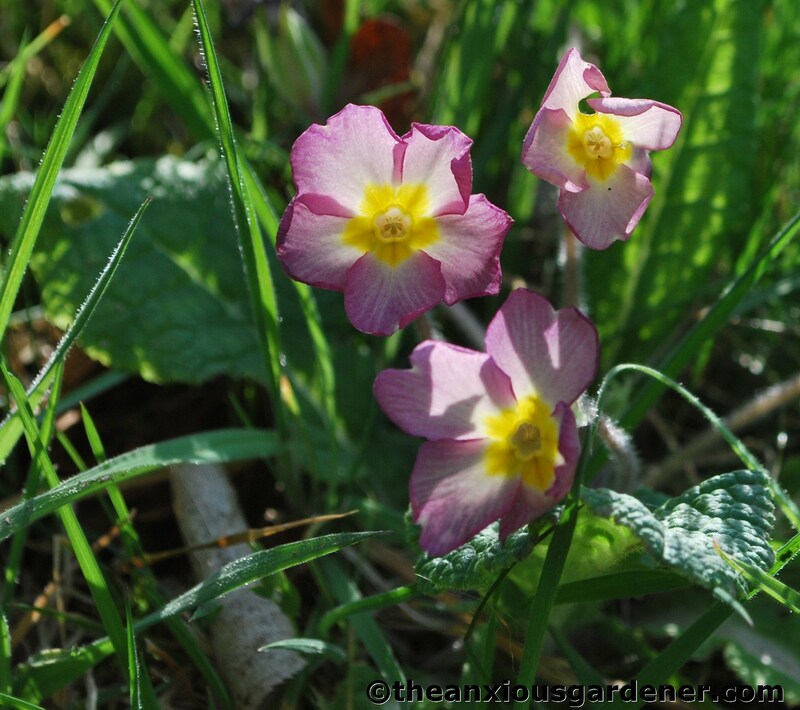 Usually I’m unimpressed with pink but, while I still prefer the common yellow primrose, I do rather like some of the variations; such as this one. … as she thought them quite rare (though a quick internet search seems to dispute this). 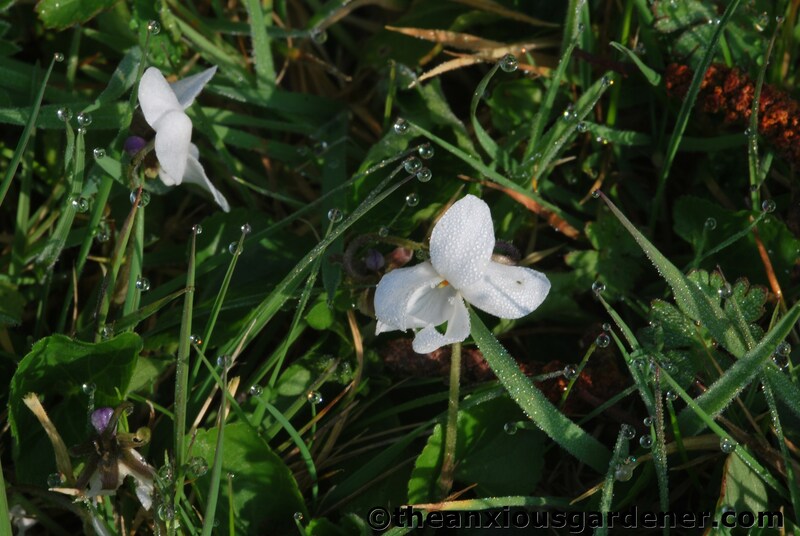 The white violas don’t mix with their common-or-garden cousins; remaining haughtily separate and aloof. We have several patches of them along the drive and by the river-bank. 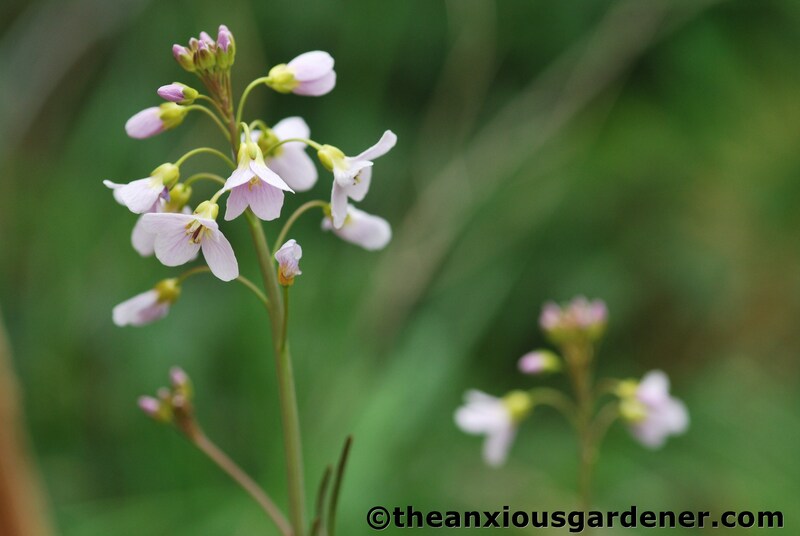 The Cuckoo Flower or Lady’s Smock (Cardamine pratensis) is common in these ‘ere parts, lining hedgerows and field margins, and is now spreading into the meadow; which pleased me no end. … a little something extra that I have added: Dog’s Tooth Violets (so-called because of the shape of their bulbs). 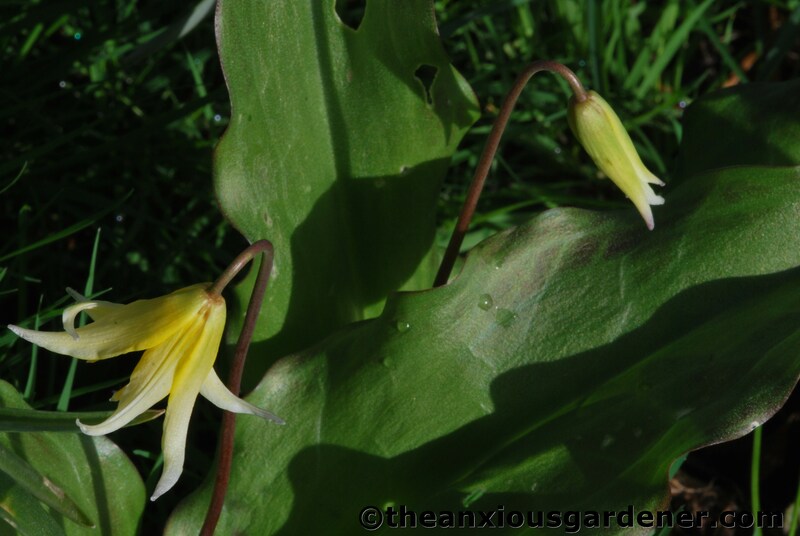 I have planted three different varieties but only this one, Erythronium pagoda, has deigned to flower. The un-mown grass is also home to a steadily increasing number of wood anemones (Anemone nemorosa). I’d like to say that their gentle, perfect spacing is down to me. But that would be a lie. I know how tricky naturalised planting is to achieve and it doesn’t come any better than this; careful where you tread. 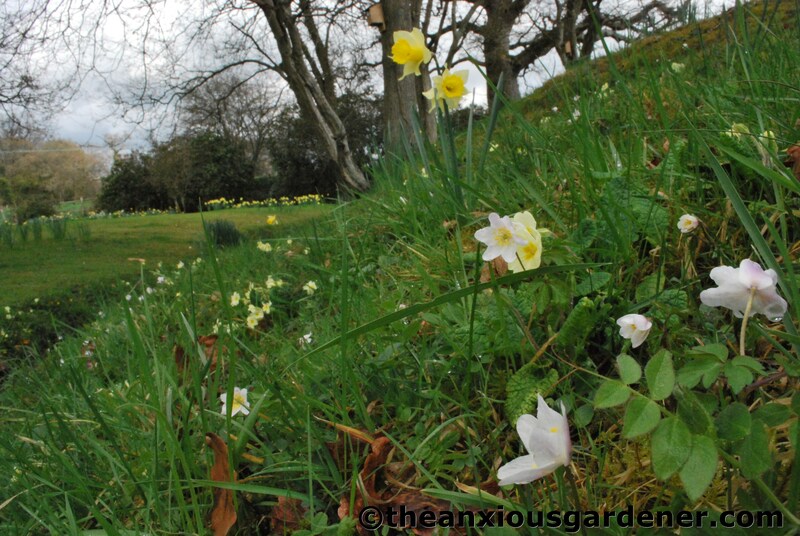 I first noticed wood anemones as a twenty-one year old visiting Rievaulx Abbey in Yorkshire. Coming from the city, I had no idea what it was but, thinking it gorgeous, plucked one to press within my angsty journal – for later identification. Now almost thirty years later, the pressed flower is still in my angsty journal and, remarkably, perfectly preserved. 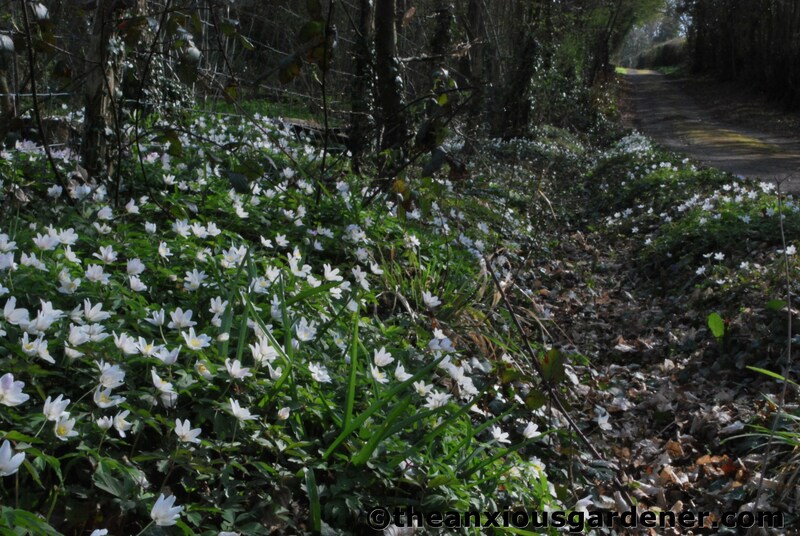 Up on the drive, where it passes through Margaret’s wood, anemones grow much more abundantly. They have erupted in number since the trees were thinned a couple of years ago and sunlight now washes the woodland floor. 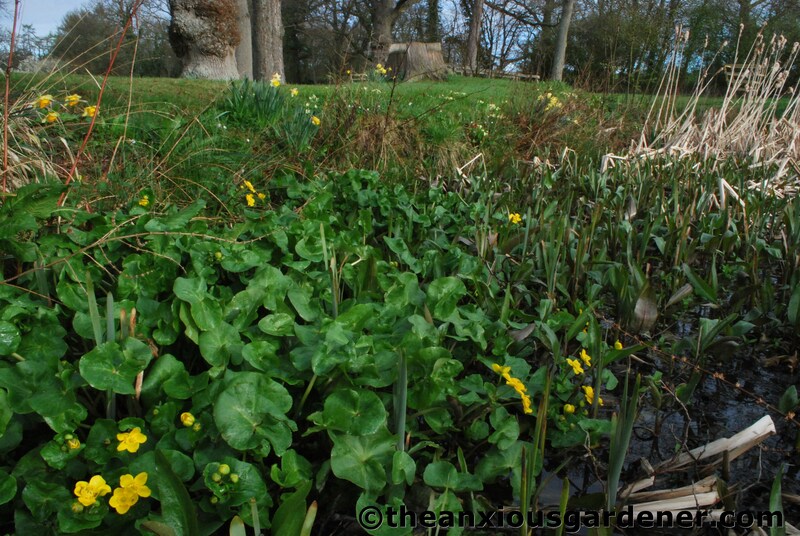 In the water margins of the gardens, I have added Kingcup (or Water Marigolds if you prefer; either way: Caltha palutris) and, unsurprisingly in this perfect habitat, it is thriving. 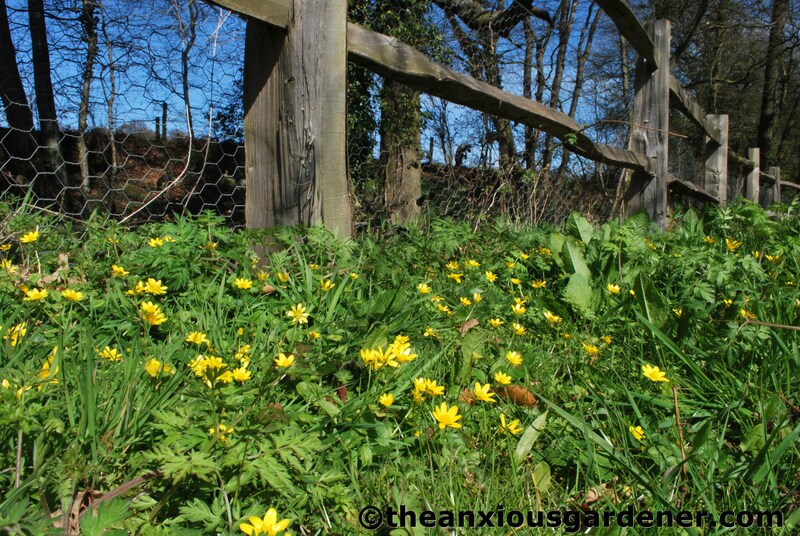 Lesser Celandine (Ranunculus ficaria) is endemic at the Priory and (very annoyingly) infests some of the formal borders. But here in the meadow, it may do as it likes – and does. Nearby is a swathe of wild flowers that, were they not already well established, I certainly would have planted. 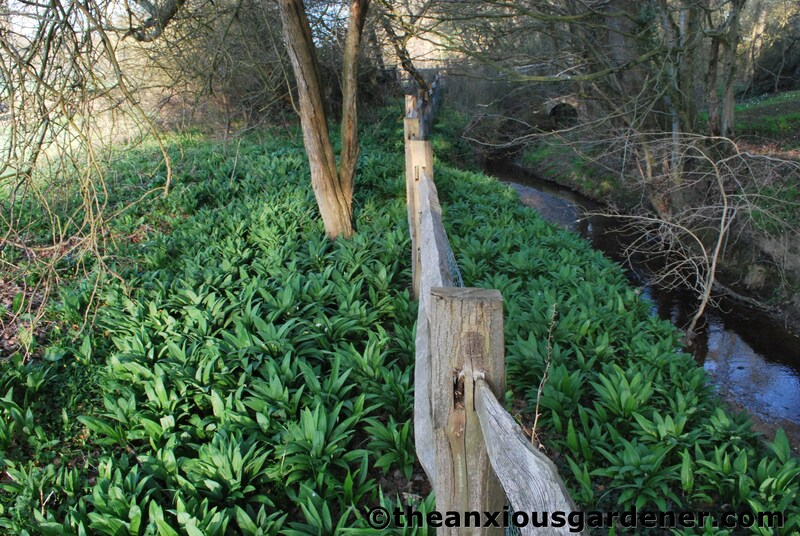 Along the river bank, on either side of the post and rail, is a heady, salami-scented expanse of Ramsons or Wild garlic (Allium ursinum). … when they all do, it is quite a sight. And smell. The sight I’ll share, in due course. The smell? Er, garlicky. Go sniff a salami; you’ll get the idea. Prunus spinosa not yet in full spate. Looking over Apeldoorn tulips to the Blackthorn. April 2011. … we must make do with this photo from last year. It is a magnificent, completely over the top, distracting performance – which I love and never tire of. I’m so glad it wasn’t chain-sawed. Aren’t you? If there’s one thing I miss about gardening professionally it is being among beauty like this all day, every day. You’ve got some great photos of it too. I was having a wee browse through this post Dave. Stunning blackthorn, anenomes and primulas. All these stunning Spring displays. Then I noticed the orchid… Gosh I thought has really been that warm? They usually flower in June in these parts. But then I read your post again (Too much skimming of text) and realized that this is a joy for later on. 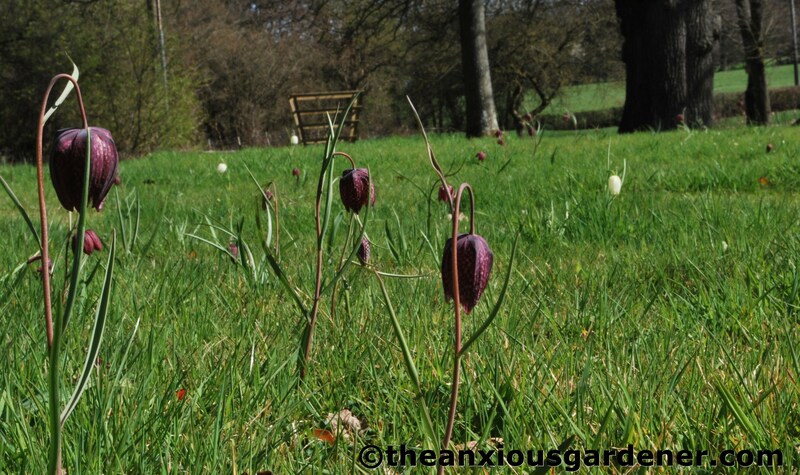 It’s also wonderful to see the snakeshead fritillaryin their natural habitat en masse. 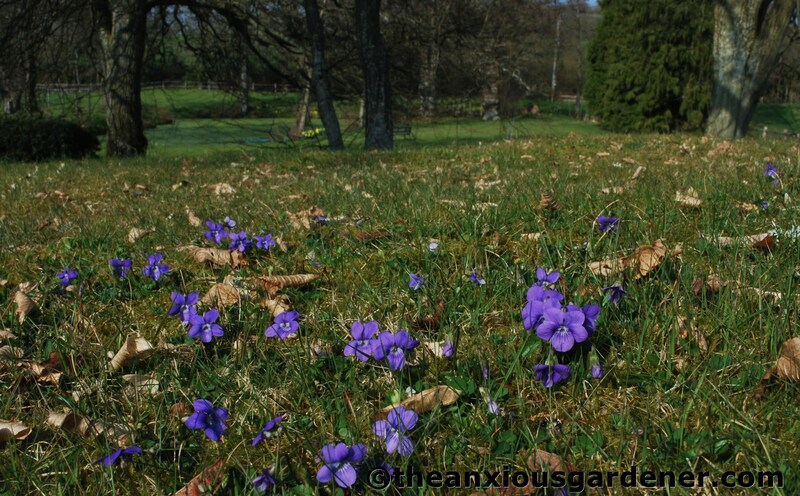 Hello Dave; You are well ahead – the difference between north and south really beginning to show now (especially since we’ve had a week or more of light frosts in this part of Scotland – which hold plants back – and no bad thing, given the catching up I have to do). 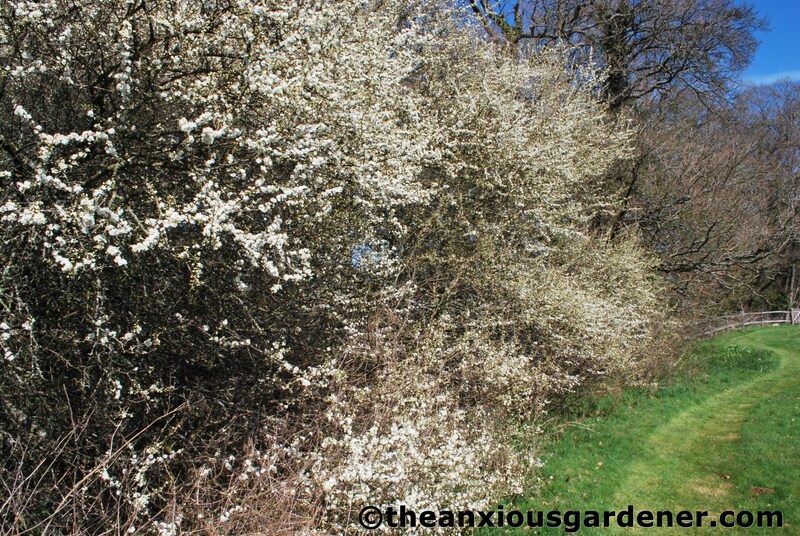 You won’t expect me to be enthusiastic about blackthorn, given what its suckers have done to my strawberry patch. I have just spent three days digging all the earth out of the raised bed, lining it with matting, and replacing the soil. Should have done that in the first place, but we live and learn…. Such beautiful photographs of what must be an even more beautiful place. Are all your wild anemones white? 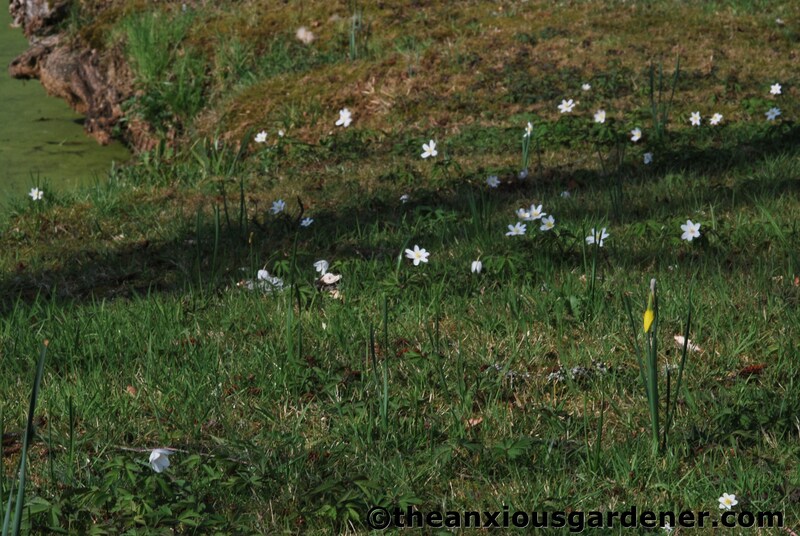 I have just found a patch of wild anemones in the wild that have other shades, while all around them are white. I have only ever seen white before. I loved your spring time post but then I love all of them – blackthorn in abundance down the side of the Cuckmere river today when I was out and about; looked pretty spectacular and I won’t hear against it! It was a lovely walk with spring erupting around us and birds abundant including a very tame heron, largely to do with the wildlife and natural habitat. Please come and make me a garden! How beautiful it all is! Lucky you to work in such surroundings. It all looks fab but my fave are the Anemones. 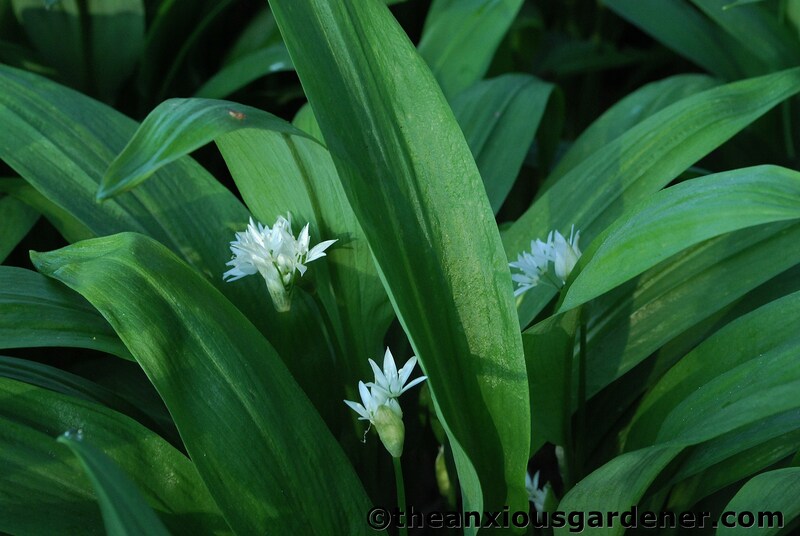 Do you know that Ramsons is lovely added to soups, pesto, salads…if you like garlic. So pretty! I love that all the flowers are trying to claim their time in the spotlight. I’ve never seen such a large forsythia! Yours looks beautiful with the forget-me-nots. I love the Peacock butterfly, too. So many beauties! Beautiful photos David! 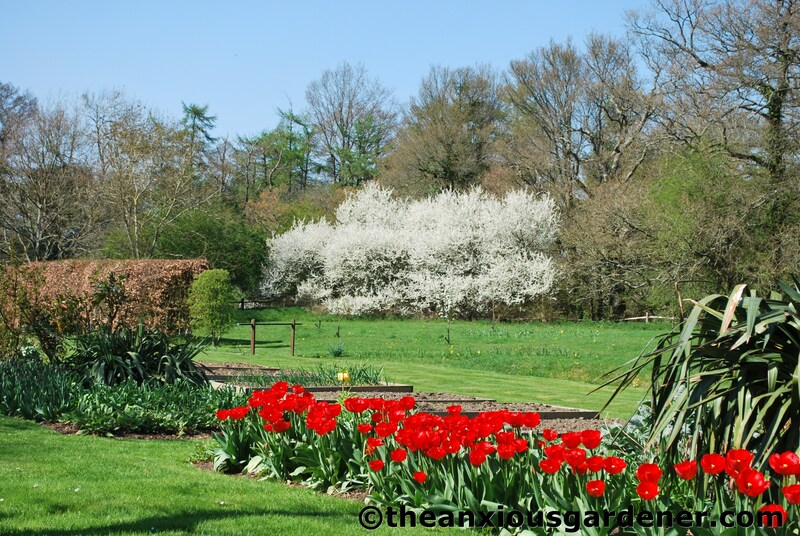 Seeing all those spring blooms in succession, collected into one blog post is very cheerful and would say captures the essence of this period very well. 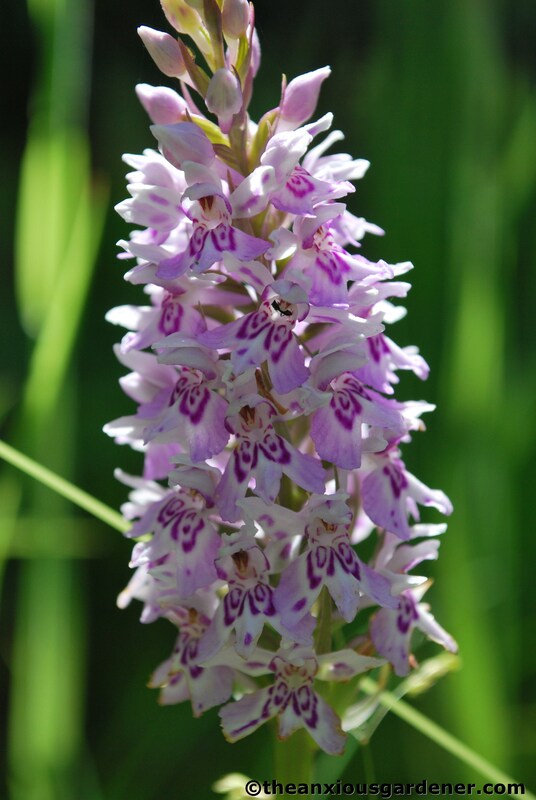 And also I think I have fallen in love with the common ground orchid all over again. 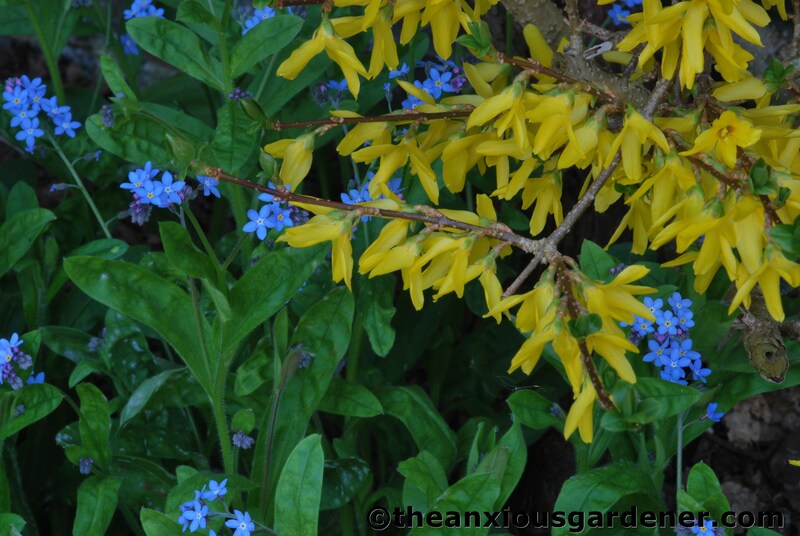 Forsythia, love it or loathe it sort of plant. I like it for its cheeky, in your face spring colour. And yes, you must plant a Magnolia stellata. Had I known there was a blackthorn hedge at stake, I wouldn’t have dropped that gentle, subtle, barely perceptible hint… I do love to see forsythia when they’re given elbow-room like that–half their charm is that beautiful loose breeziness. I’ve never had to live with one the other 11 months of the year, though. With a property like the Priory, it almost seems like the trickiest part of your job is to figure out what to leave untouched. 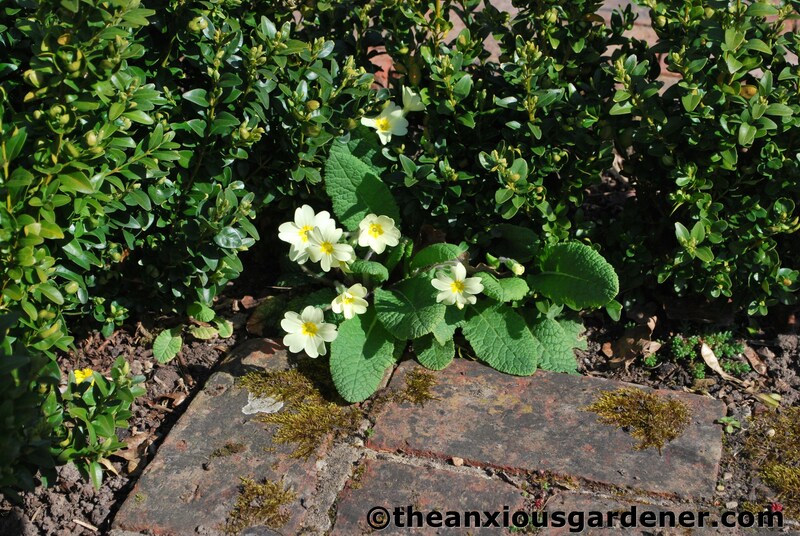 It can’t be easy to nurture an area gently along (like you’re doing so well) without changing its sense of wildness. Hehe. Might have lots and lots of good friends actually, Stacy. Lots. But you see I did have an excuse – and yours is?!! I love Wild Garlic. My parents used to have masses of it in their old garden. I dont think I could have it in mine as the garden is too small and the neighbours would complain about the smell. There is quite a bit on the Malvern Hills and you can smell it as you drive over British Camp. Hi Helen, no – don’t introduce ramsons into your garden. Jim did in our last garden and I hurriedly dug it all out again as it is very invasive. I love to see nature untended – isn’t it surprising just how it performs when we leave it alone.You are so lucky to work in such a lovely place. What an exquisite place! Fantastic photos! Great post! So glad I found your blog tonight, can’t wait to wander around it some more.